Description: Superior-sounding Japanese SHM-CD edition! It is sad that both of the musicians on this CD are no longer with us. 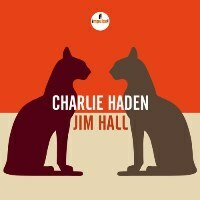 Jim Hall (1930-2013) and Charlie Haden (1937-2014) were both known for their mastery of the intimate duo setting, and they had played together more than a few times, but this set from 1990 is the only album-length live recording (that we know of) of them together. They are not only sensitive players with beautiful tone, but they share an adventurous sensibility which sometimes propell them to an "outside" territory. Their performance may sound low-key in terms of volume but the interplay is nothing but. You can tell that they are listening to each other intensely and reacting in a very creative manner. And the sound they create together is simply beautiful. One of the best jazz CDs to come out in 2014, now available as a superior-sounding SHM-CD! Recorded live at Montreal Jazz Festival on July 2, 1990.